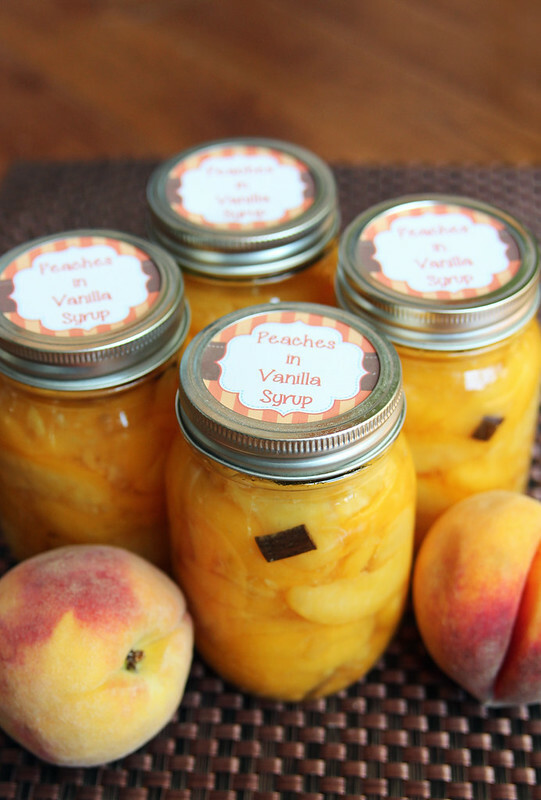 Last year was my first year canning anything and the first fruit I canned was peaches. 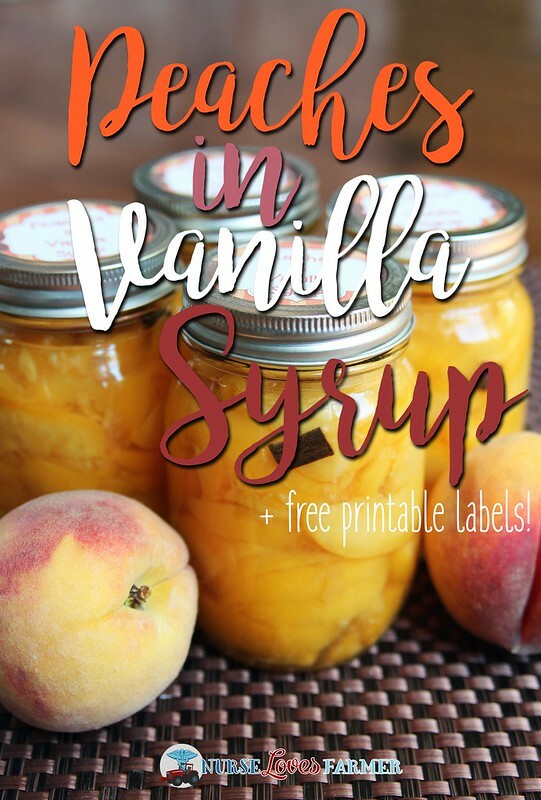 I did them in a medium simple syrup and absolutely loved them, but my husband much preferred these peaches in vanilla syrup as they have a nice, light flavour and aren’t so sugary. Firstly, fill a large bowl with cold water and Fruit Fresh and set aside. Boil a large pot of water to easily peel your peaches and then slice up the peaches and set them in the Fruit Fresh water. Prepare your canning pot and jars for water-bath canning and place the flat lids in a heat-proof bowl. Make your simple syrup by combining 2 cups of sugar and 4 cups of water and bring to a boil. May use less sugar if desired. Ladle some boiling water from the canning bot into the bowl with the flat lids and carefully remove jars from canning pot onto a folded towel. 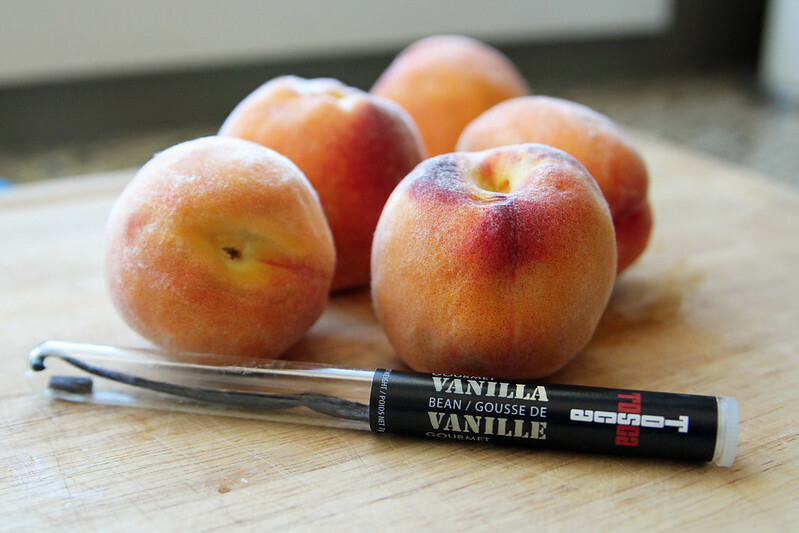 Drain your peach slices and pack them tightly into the jars leaving 1″ headspace. 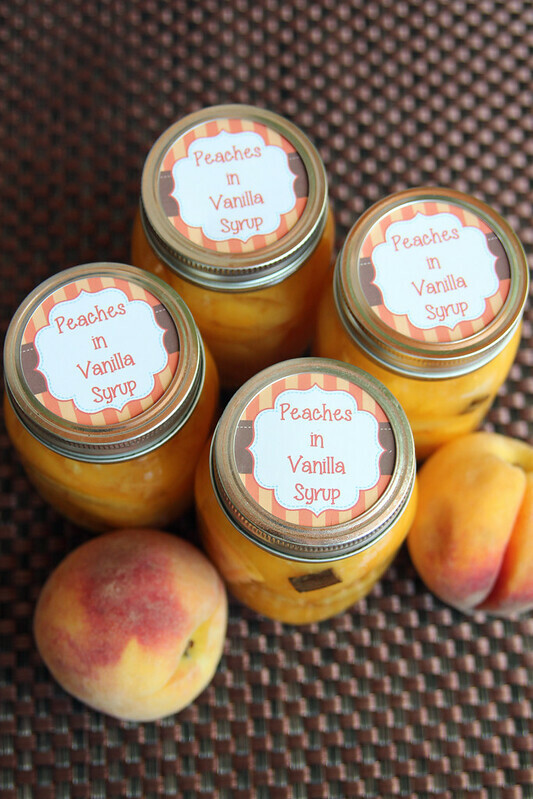 Ladle hot syrup into the jars leaving 1/2″ headspace and slip 1 or 2 pieces of vanilla bean into each jar. Use a chopstick, or something similar, to remove air bubbles around the inside of each jar and wipe the rim of each jar with a clean, damp paper towel. Place flat lids on top and screw ring around lid to finger-tight. Return jars to canning pot, making sure they are covered by at least 1/2″ of water and bring water to full rolling boil and process for 20 minutes for pint jars, 25 minutes for quart jars. Remove jars from pot to folded towel and do not disturb for 12 hours. After 1 hour check that the lids are sealed. If any are not sealed, refrigerate immediately! Print of labels below and store! 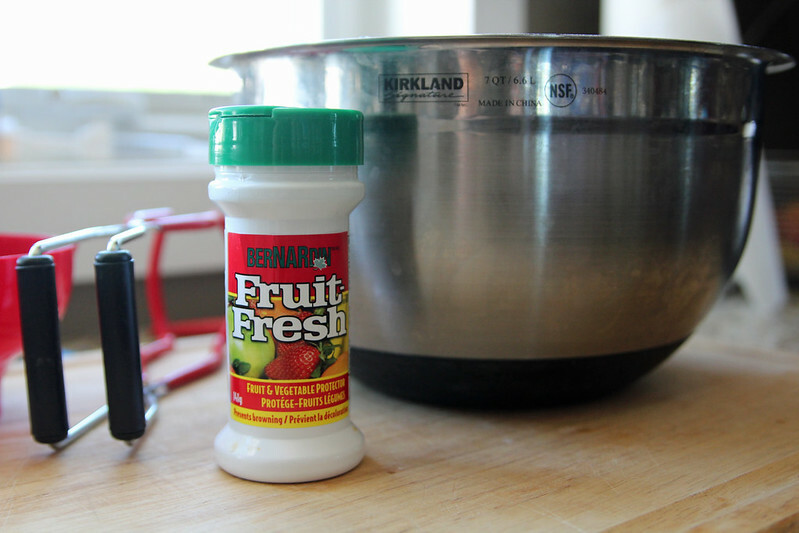 Fill a large bowl with cold water and the Fruit Fresh and set aside. Peel the peaches, slice them up, and place them in the bowl of water. Prepare your canning pot and jars for water-bath canning; place flat lids in a heatproof bowl. To make the simple syrup, combine 2 cups sugar and 4 cups of water and bring to a boil. Ladle boiling water from canning pot into the bowl with the lids and carefully remove hot jars from canning pot onto a folded towel. 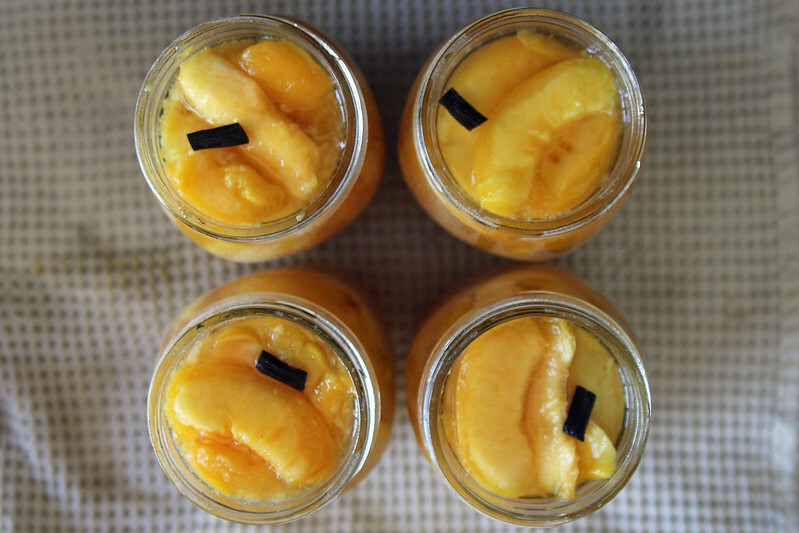 Drain the peach slices and pack them tightly into the jars, leaving 1" headspace. Ladle hot syrup into the jars leaving ½" headspace and slip 1 or 2 pieces of vanilla bean into each jar. Use a chopstick (or something similar) to remove air bubbles around the inside of each jar. Use a damp paper towel to wipe the rims of the jars clean. 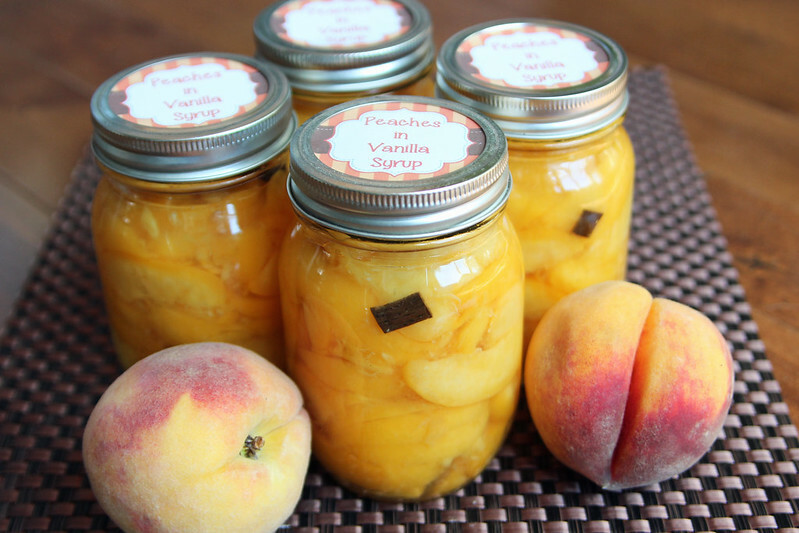 Drain water off the flat jar lids and put on top of jar of peaches. Screw a ring around the jar to finger-tight and return the jars to the water in the canning pot, making sure they are covered by at least ½" of water. Bring the water to a full rolling boil and process for 20 minutes for pint jars, 25 minute for quart jars. Remove the jars to a folded towel and do not move them for 12 hours; after 1 hour check to see if the lids have sealed by pressing down on the centre of each lid. If you can push it down, it isn't sealed and should be refrigerated immediately. Label (with my free printables!) and store. The original recipe states this makes 10 pint jars or 4 quart jars. Using the exact recipe I have only ever been able to make 6 pint jars and I cut the syrup recipe in ½ as I always end up having a lot left over. To print, right click on label image and open in a new tab for full-size image. Free for personal use only, do not save and upload anywhere else. Note: This blog post contains affiliate links, thanks for your support!